Before there were video games, we just had “games.” Most of the time it was with—and against—other people. It wasn’t fun to play by oneself, unless one had a childlike imagination. A narrative context wasn’t required to have fun playing card games or sports. The fun of competing against another person was enough, and some even took that fun very seriously. Today, the computer has allowed for a wide variety of games, attracting an equally wide variety of players. The players of video games, “gamers,” is a category meant to describe them all, but their motives, behavior, attributes of the games they play, and their “fun” vary so fundamentally that the designation has no meaning without a qualifier. This paper is a commentary on competitive gaming and how it contrasts with the other activities, examining the reasons people play competitively, what games they play, and the positive effects they have on its players. Competitive gaming is playing a multiplayer video game seriously. It isn’t fundamentally different from any other competition. Basketball, spelling bees, cup-stacking—at their core they are all tests of various skills, compared between individuals or teams. The object of “competitive” is not the particular game, but the behavior of the player. No matter what game the players are playing, if their primary goal is to win, they are playing competitively, though playing to win is a means to a different end. Competitive gamers play to win in order to stimulate themselves as much as the game allows. When playing to win in a video game, no strategy is dirty, cheap, or underhanded, so they can freely play with no limits other than the game’s unbreakable rules, which are more like physical laws. They can give it their all, with no reason to hold back. Attempting to maximize their effectiveness pushes their minds and bodies to their limit. Non-serious gamers aren’t looking for maximum stimulation, however. Their aim is the opposite: relaxation. It is here we see the divide between different ideas of fun. A common sentiment expressed is that “playing for fun” is opposed to “playing seriously,” but few competitive gamers would tell you that their tense battles aren’t fun. The apparent contradiction between light-hearted fun and exciting fun is resolved when we recognize that those two kinds of fun describe opposing emotional states, heightened senses and dulled senses, so they shouldn’t be designated by the same word. Gamers also play competitively for the unique social aspect. A competitive scene or community is a group of players that compete against each other. A competitive player is eager to find new challenges to continue stimulating them, so they often must seek out players beyond their group of friends. This can lead to arranging online matches with well-known players or in-person meet-ups with players in their local area. Players exchange strategies and meet new friends that are also committed to their hobby. In fact, some players play for the social aspect alone, with the thrill of competition as secondary. The competitive drive affects social dynamics in unique ways. The community and any sub-community is a meritocracy; one is respected by their skill level, with exceptions being those who help grow the community by running events and helping new players. Players compete against each other but they cannot succeed as on their own, even in 1v1 games. The players that fit the stereotype of training alone in their room rarely, if ever, show up to a tournament and win. The majority of competitive players stop at the local level, but community website can connect players beyond state and national borders. As competitive players get more confident, they may start traveling long distances to regional, national, and even international tournaments. Though the way a game is played determines the “competitive” distinction, communities don’t form around just any game. Many call games themselves “competitive” or “non-competitive,” but what they really mean to distinguish is whether the game’s attributes make it suitable for competition. The most important attribute is popularity. It may seem circular to say that communities form around games that have a lot of players, and it is, but you can’t play a game competitively if there’s nobody to play with. Once a game has a following, little gets in the way of its popularity spreading, even violations of other principles of competition. Accessibility plays an important part in allowing a community to grow and spread. If new players cannot learn how to play the game, they will stop playing it. However, if the game is so easy to learn that players can easily master the game, many problems arise. First, there’s not enough difference in skill to determine consistent winners. Without some degree of consistency of results, skill comparisons are less conclusive, and winning isn’t enough to determine who is the best player. Second, there’s less ways to overcome rival opponents. Lastly, the level of the top players is less respected. If it takes hardly any time to become as good as the best, it’s not impressive to be the best, so there’s less incentive to become the best. Balance is also important. Players must be on an even playing field before they start a match. That is to say, at the start of what is considered the tournament match, both players must have the exact same options available to them. This does not mean that every choice must necessarily be equally viable. On the contrary, the game should have good and bad decisions to test the player’s judgment. However, there must enough viable options or else the game lacks depth. The game also needs to test interesting skills. Skills that are interesting to a wide variety of people tend to be skills that are testable in video games but have real life analogs. For example, reaction speed, or speed in decision making, and ability to form winning strategies given constraints is a valued skill since they help us survive and thrive in life. Less closely analogous is finger dexterity, which can improve results in games but is not a fundamental life-skill. However, the development of dexterity is similar to development of other physical skills, and the ability to train effectively is a valued skill. Least valued of all is knowledge of the specifics of a game’s constraints. Knowing a lot about a game can help you win at the game, but not much else. Applying knowledge effectively and efficiently, however, is a valuable life skill. Lastly, the enigmatic skill of reading the opponent’s mind has the closest analog, as it is a skill that’s applied the same way everywhere, as the game medium does not dilute it at all. Competitive gaming communities come and go, but only a few video games stand the test of time. Games that have competitive scenes that are over 10 years old include but are not limited to Super Turbo Street Fighter II (ST), Marvel vs. Capcom 2, Starcraft: Brood War (SC:BW), Counter Strike 1.6 (CS), Super Smash Bros Melee (SSBM), a large variety of classic arcade games where competitors compete for score, like Donkey Kong, and a large variety of speed-run games, like Legend of Zelda: Ocarina of Time. These games have a few interesting things in common. First, is that none of them were designed with serious competition in mind (though some of them have sequels that were). Second, is that the games have widely used glitches and exploits that, remarkably, increase their depth instead of outright ruining competition. Third, they are physically demanding to the point of being nigh inaccessible by today’s standards, their skill ceilings being through the roof. The top players of these games are incomprehensibly strong; they are gods of their realm. The rising competitive games of today differ greatly from the old winning pattern. DotA 2 and League of Legends, the rising stars, are carefully patched every few months with balance in competitive play in mind. They are also far less physically demanding, focusing instead on testing teamwork and impromptu decision-making above all else. Most significant is the amount of developer support pulling the competitive scene along. It is unlikely that we’ll ever see a new competitive game of the old style ever again. Physical sports and non-competitive serious gaming share most of the aspects of competitive gaming, but competitive gaming achieves their primary goals to a greater degree. Like all challenging activities, those three remind us where we are lacking. Instead of pulling us into the false reality where everything is easy, they elucidate reality by removing distractions, allowing us to see how strong or weak we really are. However, physical sports distract its players with genetic heritage far more than any video game. A luck-of-the-draw advantage like height in basketball creates an unearned imbalance, distracting from the merit of the (more interesting) personal choices and willpower. Indeed, every physical sport favors a specific genetic disposition to such a degree that even at low levels of play, it is difficult to overcome differences in genetic endowment. Though intelligence is partly inherited genetically, the influence and variability is far greater in physical traits. Nobody can change his or her physical build, but one can put time into improving mental prowess. If a goal of playing physical sports is “see who is physically more suited to playing the sport,” it steals influence from skills such as the ability to play as a team, the ability to train effectively, and the ability to develop strategies while considering constraints, skills that competitive games test more closely. Serious playing of difficult player vs. AI games can have some similarities with competitive gaming, but the most important difference is that AI implementations in video games are meant to be beaten, while a human player in a competition is not. You may never stand a chance against a top player, who will be harder to beat than the hardest game. Some players play these games for the power fantasy, but because of that fact, even that emotion is felt more strongly in multiplayer games. The competitive mindset causes competitive players to choose games that are suitable for competition, but competitive games also have interesting positive effects on their players that are unrelated to the reasoning of that choice. Winning and losing, especially in pressured situations, provides feedback necessary for self-improvement. Without distractions interfering with the results, feedback is accurate enough to allow players to discover their weaknesses, so that they may develop themselves to overcome them. Improving at a video game isn’t valuable outside the scope of competition, but learning how to improve is. Competitive gaming itself is a meta-game of self-improvement, a simulation where players can strive without fear of failure. Or, at least with less consequences for failure. Competitive players may take losses as stepping stones for future wins, but nobody wants to lose when they’re on the tournament stage. To succeed, not only must players learn how to continuously improve at the game, they also must be able to perform. Competitive gaming gives its players practice bringing the best out of themselves when they really want to, as in the end, how they are when everyone’s watching is how they will be judged. The competitive drive motivates its players to utilize anything they can to win, forcing them to recognize several truths. First, is that no man is an island. People cannot reinvent the wheel and expect to improve faster than those who can utilize the many benefits of a social group. Second, is that practice and experience is everything. The players at the top are never the ones that obsessively study the game’s mechanics, developing theory, they’re the ones that are going out there and trying and failing so that can learn and improve. Third, is that excuses are irrelevant. The results that one can put forth are all that matter. Fourth, that ignoring weaknesses will result in failure. Lastly, is that they are capable of adapting and changing themselves to perform well in whatever situation they might find themselves. Competitive gaming’s analogs to life’s struggles guarantee that it rewards behavior that effects them positively in life, but no such guarantee exists for other forms of media. Themes, messages, and meanings presented by media can be outright incorrect, and reward systems in virtual worlds can train behavior that is ineffective in life. For example, experience point mechanics in RPGs give the player the sense that they are improving when they aren’t—their avatar’s numbers are just increasing. It can trick people into thinking that spending time, however ineffectively, guarantees success. Competitive gaming provides a unique mix of stimulation, community, and life lesson that few activities can rival. It’s world where interesting skills can be tested in isolation from that which distracts from them, one that does not remove what makes life interesting, but instead shows us. At the end of a competitive gamer’s journey, a possible answer to life’s meaning is posed: to walk the path of endless self-improvement. Last Man Standing was supposed to game about shooting enemies in a 2D platformer environment for score. According to the design document, enemies were supposed to spawn on a one-screen level and the player would have to defend themselves by shooting and killing enemies. It became some kind of 2D platformer with no functional mechanics other than moving, jumping and basic 2D platformer physics. I was to be the designer (I think?) and the artist. I used some sprites that I had previously and made new animations for him carrying a gun and shooting it. I created two different types of enemies and their animations, and hit reactions for everybody. Bullet sprites and death animations were also provided. The tiles that made up the level were also done by me. I also provided code for the fairly difficult-to-program (for a beginner) 2D platformer physics. This included colliding properly with ceilings, walls, and floors, including diagonal collisions, as well as setting it up to have proper parabolic jump arcs. I had hoped that this would be a good starting point for my programmer. Unfortunately, the programmer had not been working on the program before I had all the sprites in. At the beginning of the development period I provided him with some placeholder sprites to use in case he needed them, though Gamemaker Studio makes it easy to develop in the absence of sprites. In the end, there didn’t seem to be any more functionality than what I had already provided. The only content that isn’t mine seems to be a few more level screens, tutorial text, and enemy sprites (that don’t do anything) placed around. Overall, I was disappointed with my programmer. I even offered to help him if he needed any, but he declined. So, I hope you enjoy my game “Last Man Standing,” even though all that can be done is move to the right and jump until there’s nothing left to be explored. This is a “game lab” entry of my Game Studies class, just in case anyone else is actually reading this. I played 3 games and observed two of them. One was a two-player game. This was an interesting game that was reminiscent of my first few times attempting to make 2D platformers. 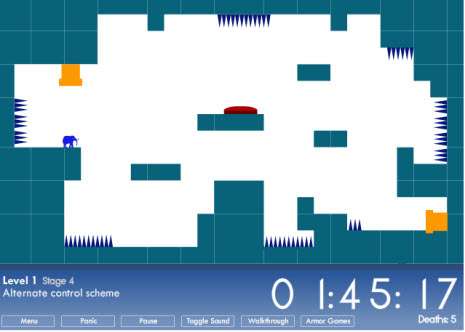 The challenges involve breaking the controls without telling you exactly how, which made the game play like a hilariously bad platformer at times. The challenge of playing with the controls made it fun though. The next game I observed my buddy play Canabalt, a auto-sidescrolling 2D platformer that made a lot of fuss when it first came out. The game involves pressing one button to avoid procedurally generated obstacles. I was delighted to see that my buddy was very bored by the game. The game is praised for its simplicity, something I don’t find worthy of praise. However, I will praise the game designer for getting so much for so little work. Third, we played SJSU’s very own Clashing Code, a 2D fighting game that is mix between Smash Bros and anime/airdasher games, a wonderful combination. Few online flash games get fighting game mechanics right, but this one succeeds in being unique while adhering to the genre’s core mechanics that are important for getting the right feel. Me and my buddy had a blast playing it, and other groups took notice. Fourth, I watched my buddy play Park Racer, a generic racing game. He had trouble controlling the car, and I could tell why. There’s just no way to have good control in racing game without having some form of analog control, like an analog stick or driving wheel. With digital controls, you have two choices. One is to have only one turning speed, and the other is to have only one turning acceleration. One turning speed is obviously bad, as you’ll be limited only one turning angle. With constant turning acceleration, you’ll be able to make small adjustments easily, but turning sharply takes time and it is difficult to stop turning, and it’s very easy to over-correct if the acceleration is too high, while it takes too long to react if too slow. This is a common issue I see in games with acceleration. They are overly simplistic physics models that aren’t quite right realistic and somehow result in over-sensitive and under-sensitive controls at the same time. The solution here is to have non-constant turning acceleration, but I’ve ranted long enough. 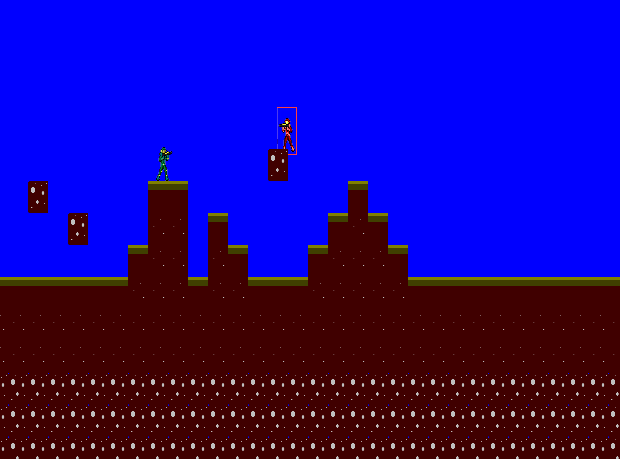 The last game was Myxa, a very basic 2D platformer made in Game Maker. Once again, I saw common pitfalls. First off, the collision system wasn’t quite right, and I could tell that they used a similar tutorial that I did, but didn’t fix the problems that the teacher purposely left in for people to solve. The game checks horizontal and vertical collisions, but doesn’t correct the player’s position unless their vertical velocity would imply a collision on the next frame or if their horizontal velocity would imply a collision on the next frame, but not both. So, you can get stuck by jumping diagonally into the corner, since there’s nothing directly below you or to the side, so the collision doesn’t trigger until the next frame when you’re already partway into the tile. The hitboxes were also wrong, too. The character was a minimalistic round ball creature, but its hitbox was square, with corners extending past the sprite. If you don’t want to piss off your players (for good reason), you need to inscribe the bounding rectangle inside the sprite, not the other way around. However, the game was still fun because it was hard. Casual Poker is a poker variant for the casual player. The goal of the game is to capture the depth and tension of poker, without needing money or chips. While removal of chips and money decreases the tension, it is made up for by addressing one of poker’s other flaws for the casual player, the slow pace. The first attempt at designing the game had players playing with large hands, collectively using the entire deck, and selecting the best 5-card hand while betting some of their cards as currency. The winner would win the cards in the pile, and the rounds would be played that way until one player had all the cards. However, this idea quickly fell on it’s face, as the winner of the first round would continue getting advantages until they were sure to win the game. The second iteration had players with their own face-down decks, made by splitting a full deck evenly, and they simply played 5-card stud with their cards as currency and 5 random cards as their hand, with one round of redrawing (like in 5-card stud). However, as soon as I began playing I remember just how boring 5-card stud is, in comparison to my personal favorite and popular choice Texas Holdem Poker. Win condition: Get the best poker hand or be the last remaining player in the round, score points, knock players out and the last remaining player wins. What you need: Deck of cards, score card, 3-5 players. except for five of them. 3. Last five cards are placed in a stack in the center. Keep the bottom card covered! 4. Dealer distributes stacks but players must not look at the cards. 5. The players that have cards from their points won from previous rounds must combine the stack of cards that they won and the new stack that he/she receives for the new round and shuffle thoroughly. 5. Player to the left of the dealer is the Big Blind. He/she must place two cards face-down, to be used as a blind bet. 6. Player to the left of the Big Blind is the Small Blind. He/she must place one card face-down as a blind bet. 7. Each player draws two cards, and may look at them. The rest of the round plays out like a round of Texas-Holdem Poker, where facedown cards are bet instead of chips, and five cards that were left undealt are used as the community cards. The only variant is that players may choose to discard and redraw cards from their deck during their turn a total of three times, as long as they have cards, before taking their turn. The winner of the round wins the betted cards in the pot counts the number of cards they won and adds them to their score. 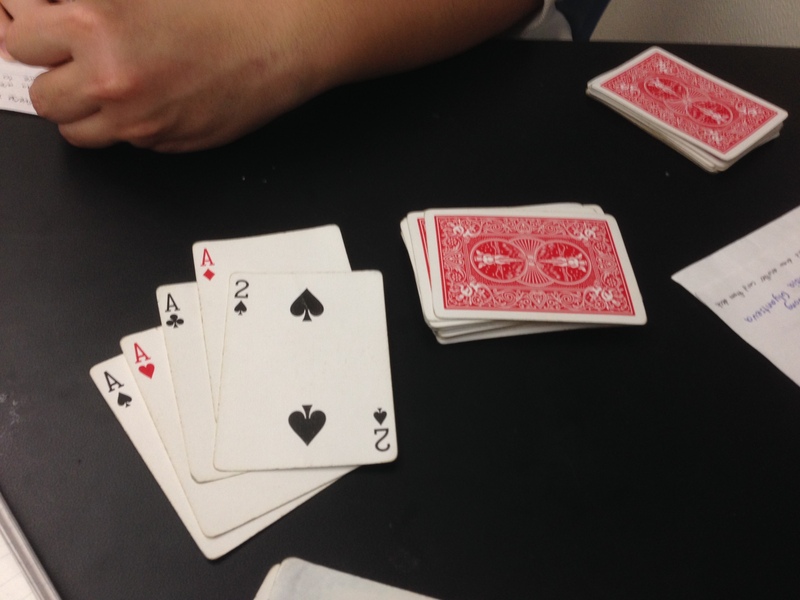 The cards are then collected and shuffled, and then the dealer deals to each player a number of cards corresponding to the number of points each player has. reset and the game is played again until only one player remains. -nobody is knocked out and the game is played again until one player has three wins. -play with more than one deck. This variant to poker results in little downtime for players, by making games short, so players can get back into the action. Even if a player gets knocked out, it’ll only be a few more minutes until the game is over and they can play again. This solves the issue of house poker games where the game drags on for hours, and players that get knocked out are left out of the fun for so long. The other issue, the slow pace, is solved by pressuring players into playing more hands. The way the mechanics are, the losses by any given player are dispersed among everyone else, so there’s no sense in waiting for pocket pairs all the time when every round you don’t play results in a loss if you don’t win. Poker games don’t tend to stand up on their own without money betting, but with this variant, players can use all the skills they’ve learned from playing poker and apply it to one that does. The only drawbacks of poker have been cut out, and what’s left is a deep game of deception and optimization, without having to fold 90% of hands pre-flop to be effective. So last Wednesday our class had our first game lab, where we play games and analyze them. The first game was Werewolf, also known as Mafia, and next two games that were played were popular card games 13 and Egyptian (War, Ratscrew, whatever). Mafia is played with a large group of people and moderator who oversees the games rules. It is a cooperative game of hidden information, with two teams, the werewolves and the villagers, attempt to find and kill each other. The teams are selected at random using a randomized deck of player cards, and team affiliations are unknown until players die. The game is played in rounds, which have a day phase and a night phase. In the day phase, everyone votes to execute one person, taking them out of the game and conversation, in an attempt to defeat the elusive werewolves. During the night, the werewolves quietly decide who to kill. Seers, who are on the villager’s team, quietly decide who to protect for the night. When the night phase ends, the moderator announces the decisions. The fun of the game is during the day phase, where everyone decides who to execute. There are no clear rules, and anyone who wants to speak can, unless they are drowned out by another person. It’s the game of social prowess and influencing the group that makes the game interesting. In the session that I played, I was a villager. Having played the game before, I knew that being a werewolf is much more fun than being a villager, so when people looked at their cards, I gauged their reactions. I also refrained from looking at my card until the last moment, just in case anyone else was running the same strategy. Both are common techniques in poker to read your opponents and hide your own feelings. Looking around, I identified two players that had nervous or excited responses to their cards. Seeing the common villager card is a disappointment, and being a werewolf is exciting, as it’s practically just you against the world. So, in the first day phase I made it known to everyone which two players I thought had “sneaky looks” when they looked at their cards. Nobody had anything else to go by yet, so I assumed that anything small would be enough for everyone to just start voting a person off. However, they didn’t believe me, and some other guy spoke up and asked “who here has played before” and he suggested that we kill them first. What led him to the conclusion that killing off good players would be advantageous is beyond me, but it backfired, and a few people, mostly the inexperienced players, assumed that the first people to suggest execution were likely to be the werewolves, which is another false assumption. It’s way more likely that werewolves will stay quiet and not draw any attention themselves, as that is much easier to execute than lying. In fact, streaming a thought process and developing some reasoning out loud is extremely difficult to fake. I assumed everyone knew that in games with voting off, like in Survivior-style reality T.V., you don’t want to draw any attention to yourself. The werewolf team is at a far greater risk if they speak up because they have less players. Of course, knowing this, I then knew that it didn’t matter if drawing attention to myself by pointing others out got me killed, as the ones I pointed out would eventually die too, due to the attention I drew to them. It would’ve been nice to play on and continue in case I was wrong, but, alas, the expected happened. I was the next to go, and in the next three rounds or so, the two I accused were voted off. One of them was a werewolf. One for two (or three if you count myself) is pretty good when there are two werewolves and thirteen villagers, I think. Eventually, the villagers won with about six people left. All in all, it was a fun game. My main criticisms for the variants of Mafia is that there usually isn’t enough bad guys, which is evident when you play a lot and see just how rarely they actually win. Also, some moderation of the voting phase would be nice. It was a bit frustrating to play with that group, as half of the players didn’t want to cast their vote at all, or say anything. The next game was 13, which is a turn-based 3+ player card game with the win condition being getting rid of all your cards, like Crazy 8s, and Uno that seems to have unintuitive card values on purpose. In this game, 2 is the highest valued card, and the suit priority is completely jumbled from what I thought was the standard spades, hearts, diamonds, clubs order. A quick google and apparently there is no standard, but there are common conventions, and 13 doesn’t follow any of them. Spades are usually have the highest priority, and in this game it’s hearts, for no good reason that I can see. Anyway, the game begins with the player with the lowest value card, 3c, and each player takes turns placing a higher valued card or combo until nobody wants to play a higher card or combo. Then, the player who played the last card gets to lead with another card, and this cycle continues until everyone is out of cards. The strategy for almost every game like this is to memorize what your opponents have played so you can predict what their other cards are. In 13, to play more cards than others you have to chain together as many rounds as you can where you have the highest cards as possible, so players have to make difficult decisions as to when they should play their high cards and low cards. They must choose when to take control by playing their strongest combo, but they first have to give up control by getting rid of their low cards. At the same time, they have to gauge the strength of their opponent’s remaining hand so their final chain of high cards isn’t interrupted. Challenging any player’s attempt for control makes you vulnerable to other players who still have their power plays. So, the game has a good amount of strategic depth, even though it’ll be largely influenced by the luck of the initial draw. We only played one game, and I came in third out of four. Last was Egyptian, also known as other names with “Egyptian” in them. Egyptian, like classic War, is out of the players’ hands as far as the cards aspect of the game is concerned. The whole deck is divided to each player, and players must take turns playing their cards blind. When someone plays a face-card, the next player gets a few chances to play another face card or else the original face-card player wins the hand, and this situation plays out recursively until someone fails to produce a face card. The goal is to get all the cards. But blind luck isn’t the fun part of the game, it’s the slapping rules. 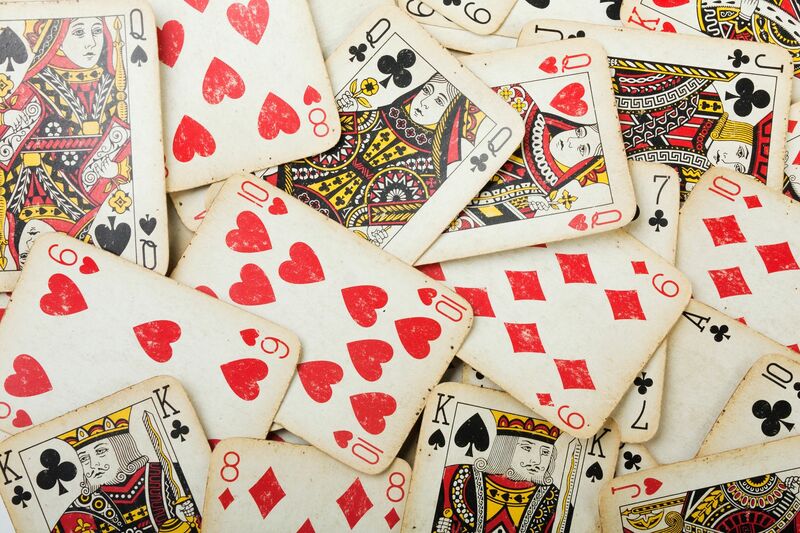 As players play cards, if they play the same numbered card as the last one or the one before it, anyone can touch the pile with their hands and win it. The result is a reaction-time based slapfest with the only strategies being related to optimizing your reaction time. I’m fairly good at reacting, (despite my actual reaction time being below average) and I could write a whole article about it, so I’m pretty good at this game. The only other aspect is memorizing card sequences after you’ve been playing long enough that you start to see sequences of cards that were picked up in piles earlier in the game. Unfortunately, we ran out of time and I wasn’t able to finish off the final remaining opponent. Surprisingly, I got good mix of skill tests that day. Werewolf tests social skills, 13 tests strategy, and Egyptian tests reflexes. Three great ways to make things fun and interesting, and (not) shockingly, they required no hidden meanings, messages, narrative, or high-res graphics to be effective. Hello, this blog has primarily been created as a requirement for CS 108 or ART 108 at San Jose State. The posts will be for class credit, but I will not hold back my criticism or enthusiasm for the course material. I’m sure many people coming into the class have their own opinions about game design, and I am one of them. It doesn’t take a movie director to be movie critic, and it doesn’t take an experienced game designer to be a game critic, but I will be learning the art of game design as I progress through this course and CS 185C, the more project-focused class. The class involves playing games and reading what people have said about games, and I will criticize them both. So, a little background: I am a gamer who began in the N64 generation, suffered the WoW era, and emerged some point down the line as an avid competitive gamer. That is to say, I generally play with competition in mind. Ideas of “fun” aside (for now), I play to improve and I play to win in competition. I rarely play non-multiplayer games, and when I do, the speed-run or score is on my mind, as that is how people compete in those games. The feeling of mastery is the best feeling there is, and that’s what I want out of games. That’s right, I’m a “try-hard,” and proud of it. My best games are Soul Calibur V, Super Smash Bros. Melee, and Heroes of Newerth. Go ahead, youtube either Signia or Signia949 and see what you find. 5:45 for actual footage of that feeling when you crush your opponents. As for my career aspirations, I am most interested in design of educational games or programs. I have witnessed firsthand how players can improve themselves through training and experience playing a game, and how a very real difference in ability can emerge, so I know that games can be the perfect avenue for training new skills. So, when playing games, for this class and otherwise, I primarily critique two things: the way the game challenges the player, and the way players learn to overcome the challenges. It is of utmost importance to identify the skills being tested and how the game compels the player to improve, for without a sense of skill, of good plays and bad plays, and the resulting punishment and reward, the game’s choices, the defining feature of games, feel arbitrary and meaningless. Not only would choices in the game already be mostly inconsequential for the game of life outside of it, but they would have no meaning even within the game’s context, and with that, neither learning by classical conditioning nor feeling of mastery is possible. So, that’s where I am going into this.